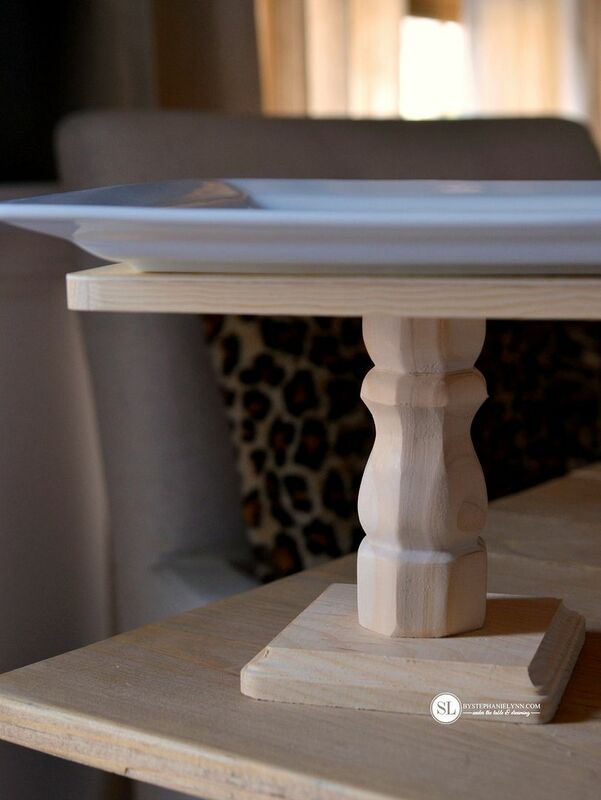 DIY Cake Plate Dessert Stand | make your own wooden dessert stands – When it comes to entertaining, one can never have too many cake stands. From appetizers and hors d’oeuvres to cakes and baked goods – these versatile serving pieces can add a touch of style and elegance to any party display. One of my favorite parts of planning a party menu is setting up a themed dessert table. 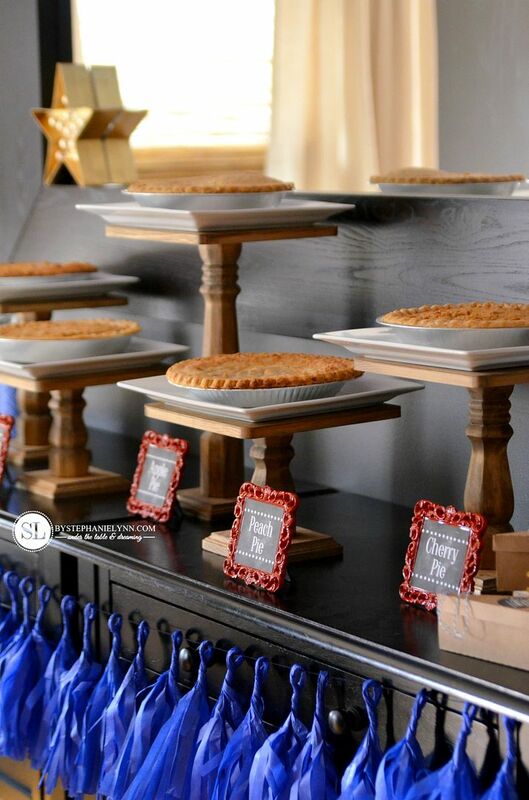 While it’s easy to get carried away with elaborate designs, even the simplest ideas can be transformed into fun displays with the addition of a few cake stands. Using a variety of cake stands to display desserts not only creates a pretty presentation, but adds height, depth, and visual interest to any table design. Even though cake stands can be found in an assortment of styles and colors – you can easily create your own with just a few simple supplies. 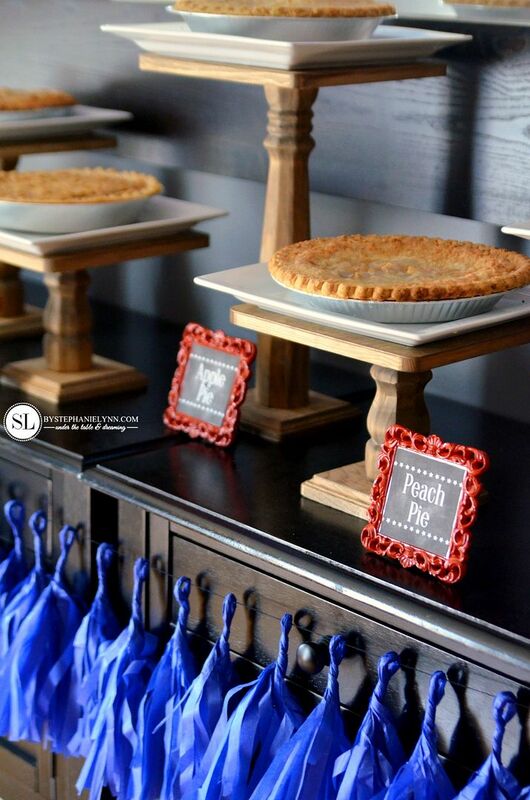 These wooden dessert stands were created for the recent Pie Bar Dessert Table I put together for Michaels. 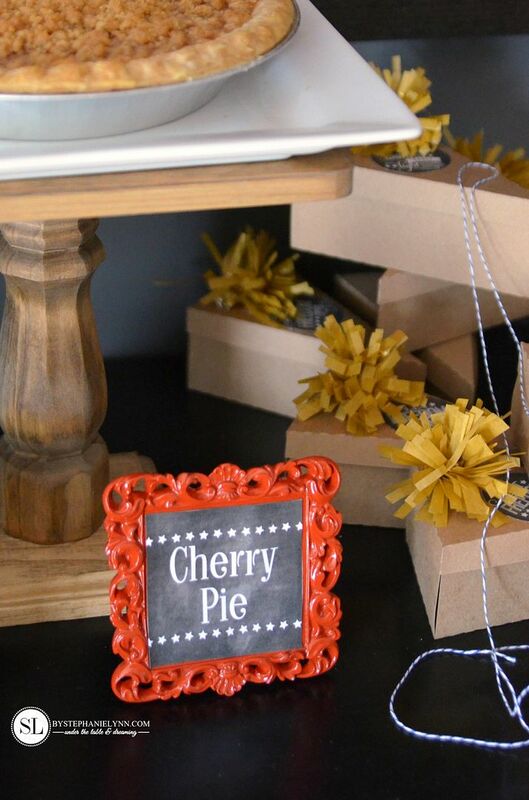 This DIY version was a great way to affordably create six separate cake stands for the table, all with a cohesive look. 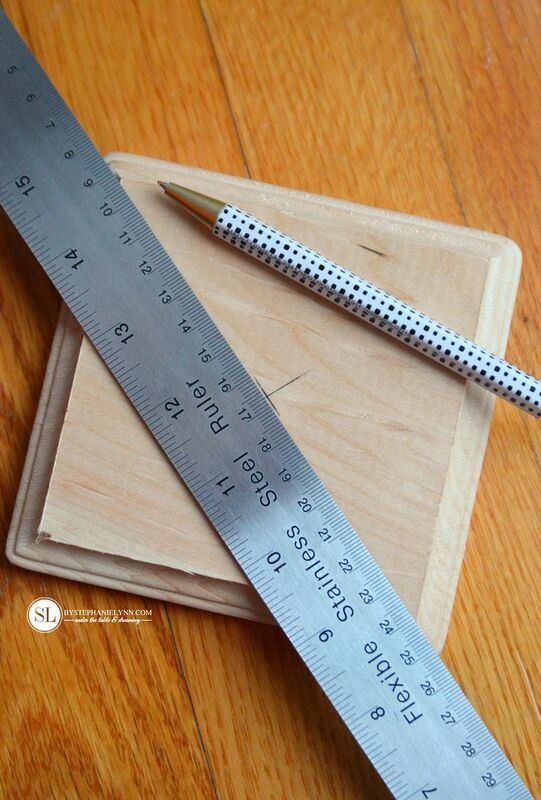 Step One: Use a ruler and the ‘big X’ method to find the center of the small unfinished wooden plaque. Make a straight edge from one corner to the other, using the ruler, and mark a small line in the center – then repeat the other way. These small wooden plaques can be found in the unfinished wood section at Michaels. They are in bins, come in a variety of shapes and sizes, and cost around $1 a piece. 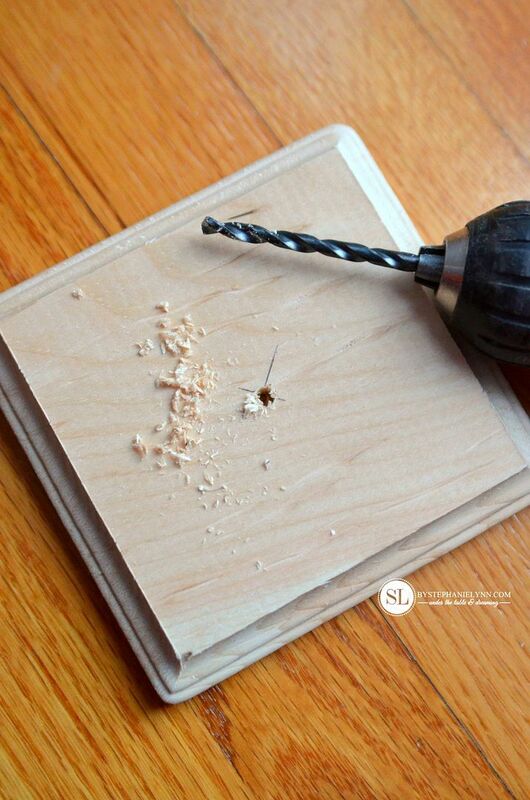 Step Two: Using a hand drill, drill a hole in the center of the small plaque. This hole is only a starter hole to screw in the table leg so it does not have to be deep and should not be drilled completely through the plaque. Step Three: Attach the table leg to the small wooden plaque. For added stability, apply a small amount of wood glue prior to screwing in the table leg. The table legs come in assorted heights. For our Pie Bar we used two 6 inch legs, two 9 inch legs, and one 14 inch leg. They also come with a pre-installed 5/16-18 hanger bolt, making this an easy diy project. Step Four: Apply wood glue to the top of the table leg and attach the 9×9 wooden plaque. The Square 9X9 Wood Plaque can also be found in the unfinished wood section at Michaels. These are made for mosaics and have a inset space for the tiles, however, the plaque is turned upside down – so the smooth, flat surface can be used for the top of the dessert stands. Prior to attaching the plaque, find the center of the ‘bottom’ by taking a straight edge from one corner to the other and mark a small line in the center – then repeat the other way. Finding the center will ensure your dessert stand is balanced and sturdy. 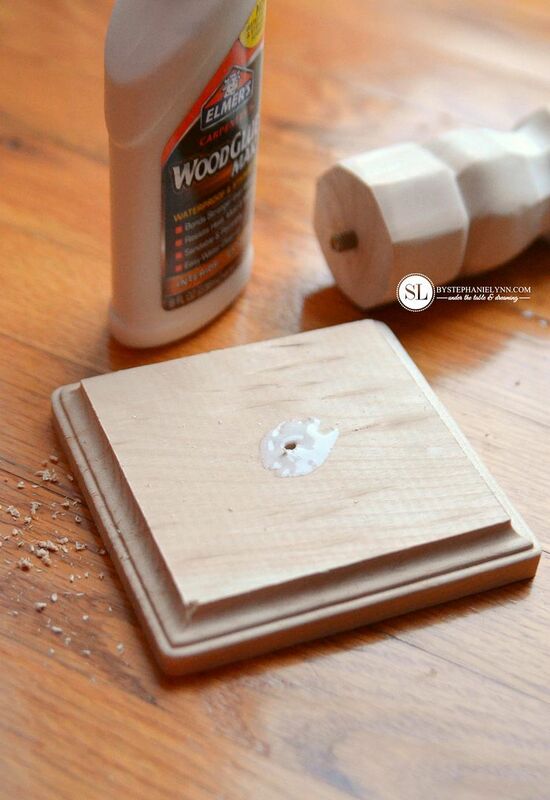 Once the top plaque is attached, sit a heavy object on top of the stand until the wood glue is completely dry. 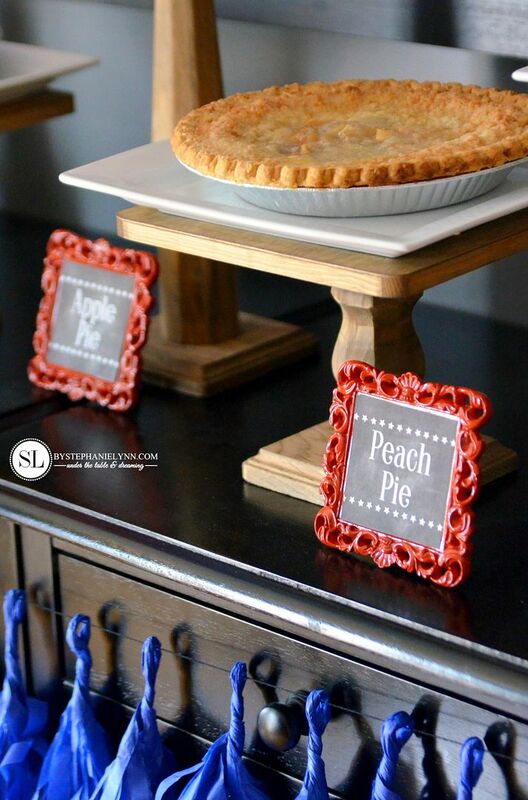 Since these were being used for our Pie Bar Dessert Table, the wood glue was sufficient enough to bond the materials together and hold the top sturdy. 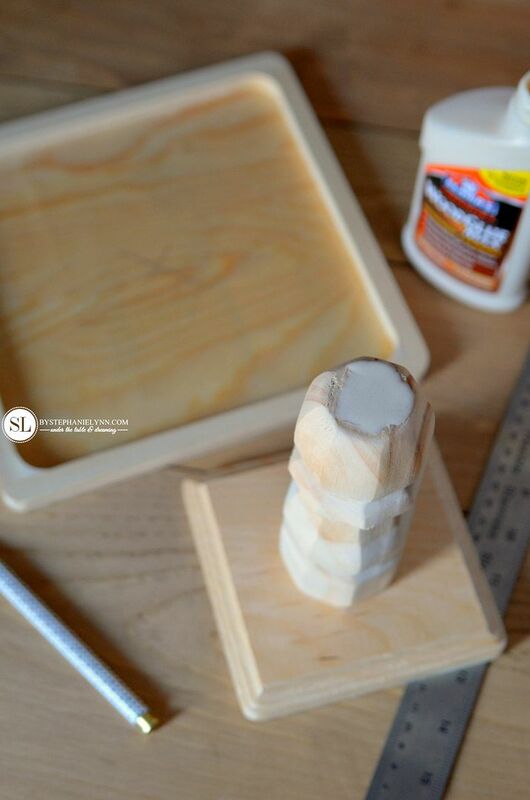 Step Five: Once the glue has completely set, the stand can be stained or painted. 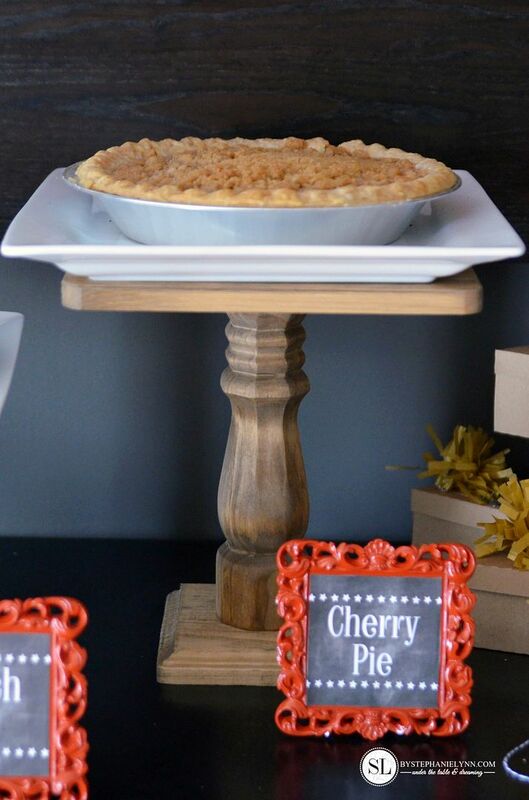 Since the dessert stands were being used for our Pie Bar, plain white square dinner plates were used on top of the stands so the grease from the pie tins would not ruin the wood. I need to do this, they turned out fantastic! They are so cool! I love the idea of elevating various desserts for my guests to choose from. Clever and inexpensive! So cool, I never knew it was that easy! This opens up a whole list of possibilities to make different ones depending upon the dessert and holiday! Love it. These are so lovely, I can see wanting to make these and paint them red for Christmas or black and orange for Halloween. The way you have stained them make them so classic and a touch traditional I can see these just as they are lined up with all of the desserts on a sideboard for Thanksgiving. You have shown how easy it is to make them, which is great. I would be so honored if you would stop by and share this post at my new link party over at Celebrate and Decorate.